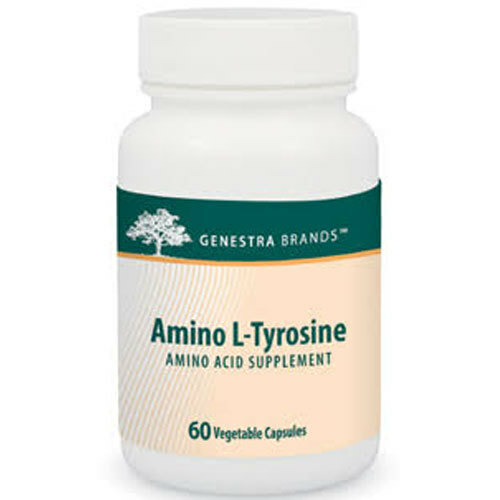 Genestra Amino L-Tyrosine contains no artificial coloring and flavoring. Warnings: If you are pregnant or breastfeeding; or if you are following a low protein diet, consult your health care practitioner prior to use. Keep out of reach of children. Safety-sealed for your protection and for product freshness. Do not use if outer seal is missing or broken. Store in a cool, dry place. Notes: Contains no added wheat, starch, yeast, gluten, corn, soy, sodium, sugar, artificial coloring or flavoring, antimicrobial preservatives, dairy or animal products. Ideal for vegans. The capsules are made from 100% pure vegetable sources, free of preservatives and additives. Recommended Use: Take one capsule three times daily, or as recommended by your health care practitioner. For prolonged use, consult your health care practitioner.